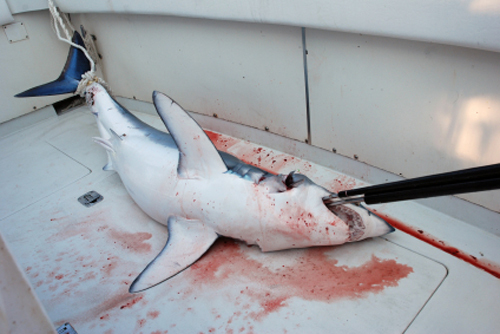 Today, modern fishing techniques enable fishermen to fish numerous sharks in little time. The commercial value of shark fins is much higher than the price of the shark flesh, and this has given rise to a useless cruelty. When a shark is captured, it is lifted on board the ship and only its fins are cut off, while it is still alive, and then it is thrown back into the sea where it dies suffocated or of starvation (finning). Therefore 95-99% of the animal is wasted, because for those who fish for shark fins, it is more convenient to fill the hold of their ship with only fins, leaving more room for the more expensive fish, such as tuna fish and sword fish, rather than keep the whole shark that is edible, but is not as valuable. According to IUCN, the percentage of sharks in the North Eastern Atlantic Ocean and in the Mediterranean, that have been included in the Red List of endangered species, is the highest in the world. Of all the species that were examined, about one third are in danger of becoming extinct.